This beautiful building houses KRLD’s new super-power 50,000 watt transmitter. In the background you see a part of the massive 475-foot towers used in broadcasting KRLD programs. The transmitter is located between Dallas and Garland. You are invited to keep your dial on 1040. KRLD is the home station of the Stamps Quartet. Such a beautiful art deco building! And, I believe, it’s still in use. My favorite aside about the early days of KRLD was that when it began broadcasting — from a small room in the Adolphus Hotel in 1926 — the station was on the air for only six hours a day, “except on Wednesdays when the station closed down to make repairs and recharge the batteries.” Also, according to the KRLD website, the station was “the first radio station in the world to sell commercials.” Of course it was — leave it to Dallas to invent the radio ad. 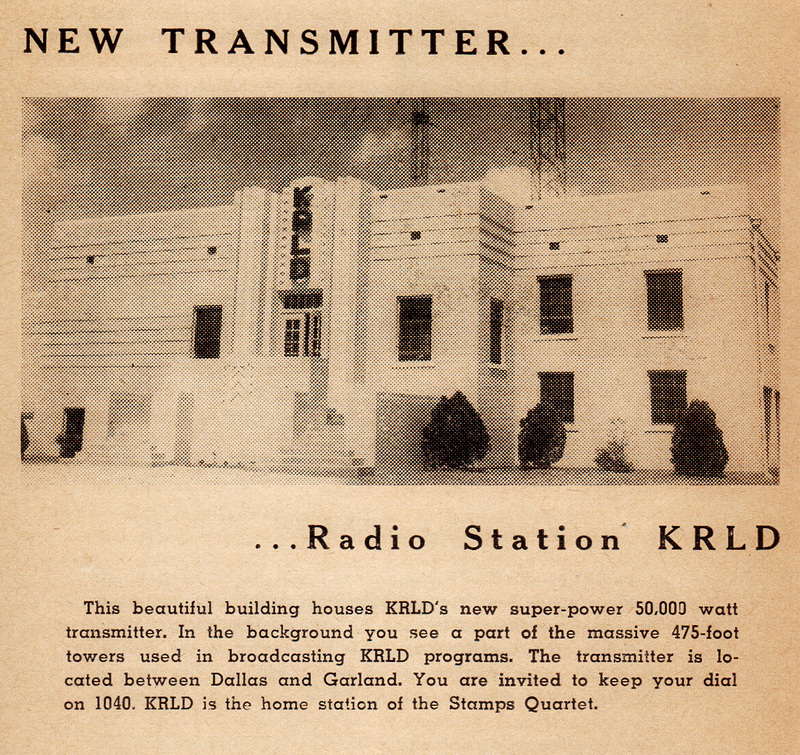 For a history of KRLD and a photo of what the transmitter looks like today, see here. For an aerial view of the transmitter in 1949, see here (from the Edwin J. Foscue Map Library, Central University Libraries, Southern Methodist University). Home of the Stamps Quartet. As a kid, heard them often.